Confluence is a powerful platform for managing online projects related to any kind of functional departments, be it marketing, finance, legal or human resource. It enables the user to plan projects, form communities, discover, share and discuss ideas, ask for recommendations and gather feedback from the team members, making it quick and simple to complete the task conveniently. It can also be integrated with JIRA software that helps in tracking issues and bugs, resolving issues with the help of function-rich tools such as ready-made templates, in-line comments, @-mentions, page likes etc., so that the project work can be organized and executed smoothly. How much does Confluence cost ? 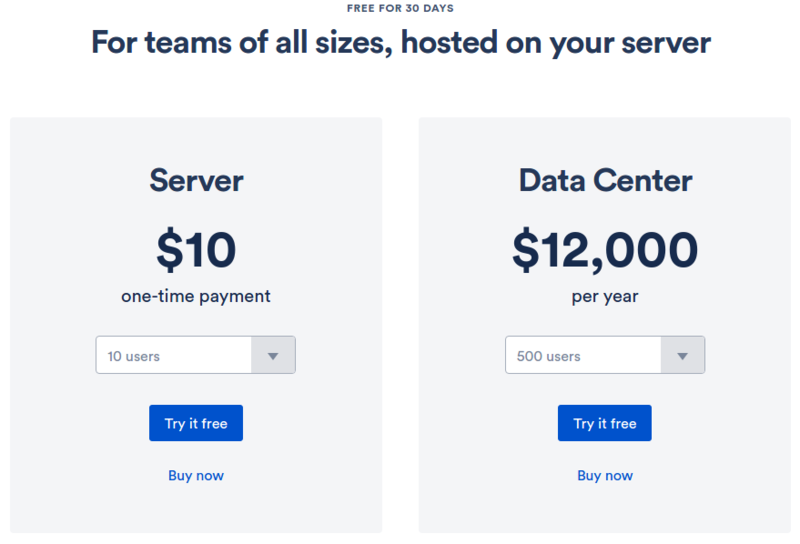 The pricing for Confluence starts at $5.0 per user per month. Confluence has 3 different plans such as - Cloud at $5.0 per user per month, Server at $10.0 and Data Center at $1200.0 per year. Based upon the Number of Users the Pricing Plan Varies.Please Contact the Vendor to get the Detailed Pricing. Based upon the Number of Users the Pricing Details Varies,Please Contact the Vendor for the Detailed Pricing. Pros: Quick adoption and almost no learning curve to start using. Good set of features that leverages teamwork. Cons: The support could be quicker fixing the reported issues. Pros: So easy to keep things updated in our work documentation. We use this product daily when creating training material, and keeping it organized. Cons: Really not much to not like about this product. I sometimes get annoyed with the emails we receive when a change is made, but I understand the purpose. Pros: This is a very easy to use Wiki system that allows a clear connection to our Jira projects. This is very helpful to anyone who is also involved, and the pricing is fair (it is per user). Cons: Though there is an initial learning curve, Confluence is wonderful to use and very much worth the effort. 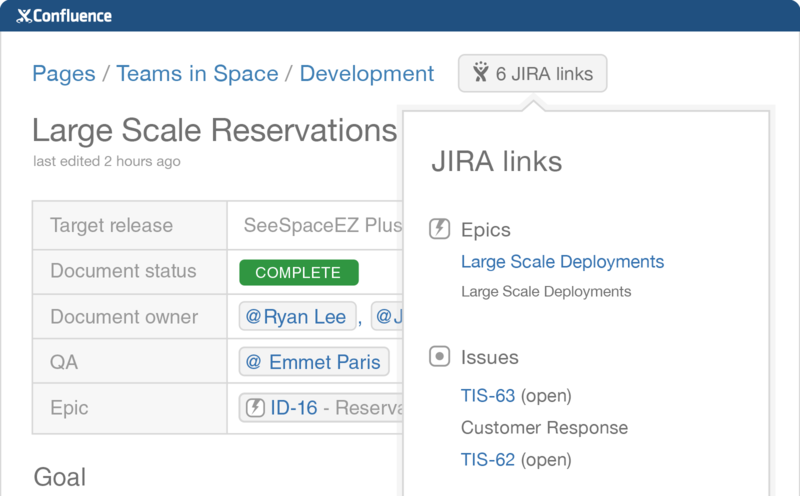 Overall: We use this to have additional information/test plans for our projects that we administer in Jira. Pros: It's a good space to keep a lot of documentation for different users, internal and external. Cons: The tasks feature is terribly broken. I rely on it a lot and can no longer trust it. When I check off a task and check the completed tasks list, it actually checked off the wrong task. Pros: It is used in our organization as it helps in documenting the content at one place so everyone can see it and also because it integrates very well with JIRA. It becomes communication with all the team members very easy and helps in better collaboration. Cons: There are a lot of options available which confuse us while using them that what they do. It confuses us very much and we need to google them to find their use which is very time confusing. Pros: This is very great tool to share information among different departments. Different tabs can be made in order to share information specific to particular department and can add tabs for other departments. All information access is found at one place and everyone can collaborate to access this information at one place and speed up the process. Cons: The user interface is very basic and old. I think more user experience need to be add. Menu options can be customized to include more options. Cons: - Search: This is one of the basic requirement of any document inventory and confluence search needs a lot of improvement. Overall: Overall has been a good experience so far except the search limitation. We use this for all of our internal documentation, design doc reviews, etc. Pros: I love how easy it is for my team to organize our thoughts and share files and ideas for new features for our product. Cons: I haven't run in to anything that I don't like about the system yet. Overall: We're using Confluence as a way to organize documentation of features and functionality for our product before we push them out through the system to the end user, and it's very helpful. Pros: To tag the colleagues and get the notifications from them is the best feature for me to keep them updated with the latest news. Cons: When two or more people updating the status on the same page, then sometimes overrides the content. 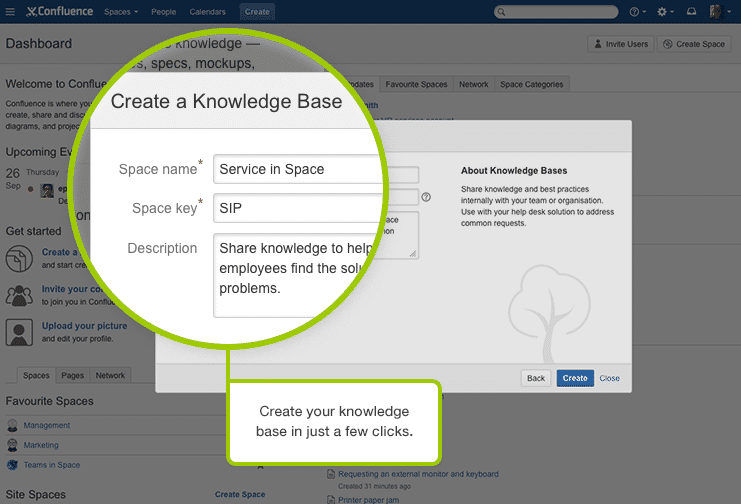 Overall: My overall experience with Confluence is good.